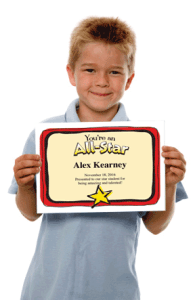 Lacrosse certificates of achievement for kids and coaches provide a quick solution to recognize team members. Great designs and easy to use! Cool lacrosse awards for both boys and girls teams – recognize players, coaches and team parents. Simply, personalize, print and present. Choose from 20 different certificates. When you purchase you’ll receive a PDF file that can be used on Mac’s or PC’s. Use them year-after-year for multiple teams – it’s a great deal! 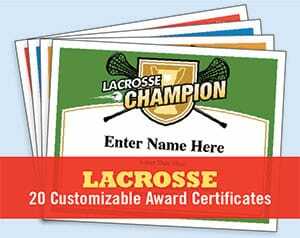 Personalize these lacrosse award certificates templates with players’ names, your team names, date, and your own words of praise. Designs are set to work on standard 8.5” x 11” paper. The polished way to leave a lasting impression on players. 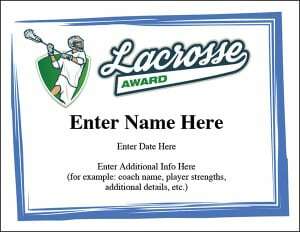 In additions to the LAX awards, there are even a few coaching forms: Player Expectations, Parents Expectations, a Heads-up Form and Lacrosse Homework. • Make your players smile! Kids, and adults for that matter, love to hear words of praise. Put the good news down in writing so that folks can enjoy it for the months ahead. • Print as many as you like for your team. Don’t forget that you can use this year after year. 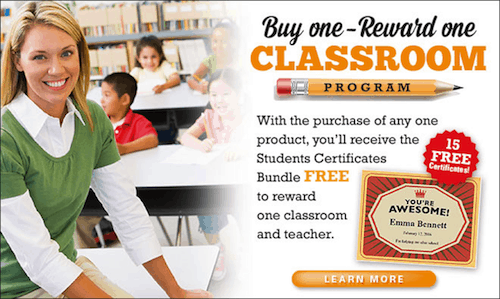 Buy these lacrosse certificates and reward your favorite teacher! 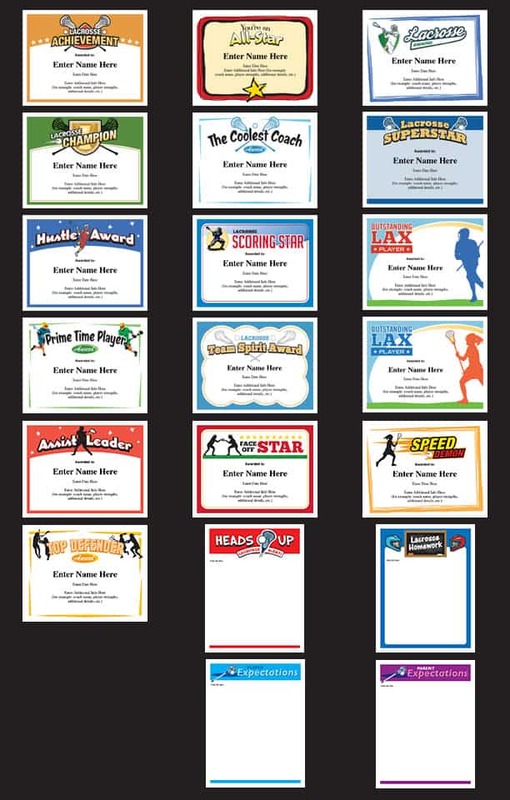 Lots of coaches and team parents use these certificates at the season ending parties. However, many choose to give these awards out throughout the year to keep players engaged. It’s your call. 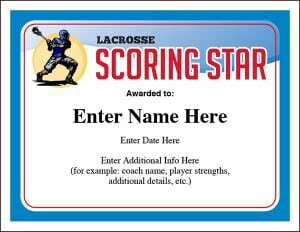 Let’s take a closer look at these lacrosse certificates options. When you purchase this digital product, you’ll be immediately sent a link enabling you to download the PDF. The PDF file, which you’ll save to your computer, works on PCs and Macs. 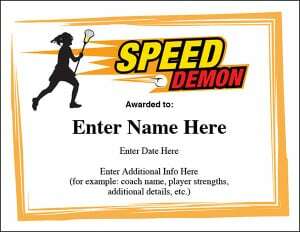 Tip: Consider including lacrosse quotes or some fun, lacrosse slogans on the certificates.